This Addin Guide contains proprietary information and shall not be used, disclosed, reproduced or shared, in whole or in part, without the prior written consent of the application developer.Should you need to do this or require further clarification, please contact the CRM Connect support desk quoting your serial number. This page will guide you through configuration and basic use of the CRM Connect Salesforce CRM Add-in.It is expected that you are already familiar with the Address Book, Call History and Preview window, and the basic concepts of integration and screen popping using the Add-ins.See the 'User Guide' for these topics. Salesforce CRM and the database used to store your contact data should already be installed and working normally before proceeding with this integration. CRM Connect must also be installed already with the initial configuration completed.If this is not the case, please see the 'Technical Installation Guide' or consult your system administrator. *Instructions on where to find this information are given below if required. Right-click the CRM Connect tray icon in the system tray menu and then left-click the 'Configuration' option from the menu that pops up, this will open the 'configuration' screen.In the 'Integration' area, click the 'Add new' button, select 'Salesforce CRM' from the 'Type' dropdown box and then click the 'Set' button. 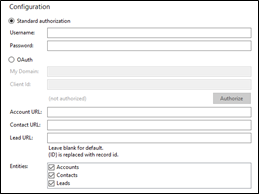 On the Configuration group, enter your Salesforce CRM account login information. Salesforce CRM uses an additional security measure called a security token which needs to be added to the end of your password.For example, if your password is 'mypassword' and your security token is 'XYZ123', you should type 'mypasswordXYZ123' into the 'Password' box. If you're not sure what your security token is, you can reset it by first logging into your Salesforce CRM account.Then go into your name account's 'Settings' page by clicking the option near the top-right corner. Then, in the 'My Personal Information' group of settings, click on the link that says 'Reset your security token' and follow the instructions on the page that is loaded.Your new security token will be sent to your registered email address and that's all there is to do in Salesforce CRM itself. Back on the CRM Connect 'Configuration' group, select which of your Salesforce CRM account modules you want to be used by checking the corresponding boxes in the 'Objects' section. Click the 'Save' button to store the information you've entered and apply the configuration. To test if the configuration worked, enter a phone number from your Salesforce CRM account into the 'Telephone' box in the 'Integration test' area and click the 'Search' button.The results will be displayed after a few seconds. The test area results should look similar to the results showing in the image here.If the test does not work, go to the 'Log' page of configuration and turn on logging, then do the test again and see if there are any errors in the log. This issue may occur if your organization uses a proxy server for your network's traffic and when you have configured Salesforce CRM Addin in your client. The key here is "(407) Proxy Authentication Required".During the initial communications with Salesforce to authenticate, we expect a callback to the client.If this message does not get through your proxy server then it cannot authenticate. This article explains how to add Salesforce as a trusted site so that it is not blocked. 2015-07-15T16:01:48Salesforce CRM Load failed. Exception: The remote server returned an error: (407) Proxy Authentication Required. When a call comes in, the CRM Connect 'Preview Window' will pop up and display the phone number that is calling.If the caller is recognized as one of your contacts from Salesforce CRM, their details will also be displayed and you can 'pop' their Salesforce CRM contact record by clicking the 'Salesforce CRM' button in the window. You can also pop recognized callers' Salesforce CRM contact records by clicking the 'Salesforce CRM' button on the 'Phone Window'. Calls can be deflected to another extension before answering them by clicking the 'Deflect' button, entering the extension number into the 'Number' box and then clicking the 'Deflect' button next to it or pressing 'Enter'. To answer a call on either the 'Preview' or 'Phone' window, you just need to click the 'Answer' button. To speak to a colleague during an active call, click the 'Consult' button, enter the extension number into the 'Number' box and then click the 'Consult' button next to it or press 'Enter'.The active call is automatically held.To end the call to your colleague and resume the held call, click 'Cancel'. To transfer a call to another extension, click the 'Transfer' button, enter the extension number into the 'Number' box and then click the 'Transfer' button next to it or press 'Enter'.